The Indian grandmaster will take on Magnus Carlsen in a rematch of last year’s championship, which was won by the Norwegian in Chennai. Sochi will host the summit clash in world chess as challenger Viswanathan Anand looks to take the title back from world champion Magnus Carlsen. The World Chess Championship will be held in the Russian resort city from November 7 to 28. As was the case last year, ‘Vishy’ is largely seen as underdog against the Norwegian sensation. 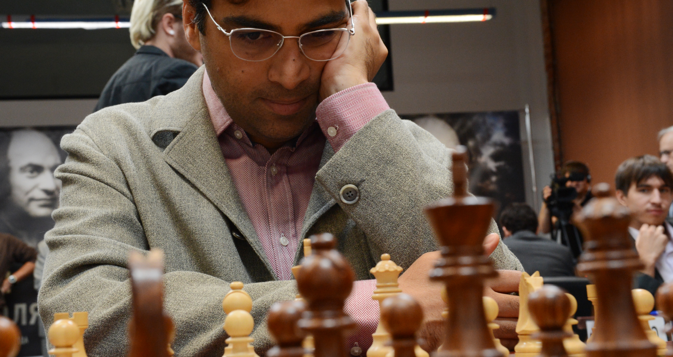 However, Anand has been in great form this year. He decided to take part in the 2014 Candidates Tournament in Khanty-Mansiysk (the qualifier for the World Championship) just one before the start of the tournament. The odds were stacked against the Indian chess legend, but he still managed to win the tournament. According to media reports, the Norwegian was initially not keen to play in Sochi. Anand recently told The Economic Times that he did not share Carlsen’s apprehensions about the Russian city. “Aruna (Anand’s wife) has inspected the venue and the arrangements seem fine,” he told the paper. Anand, a five-time world champion, last won the championship in Moscow’s Tretyakov Gallery in 2012 when he defeated Israel’s Boris Gelfand. Both players were invited for tea by Russian President Vladimir Putin. Russia has played a role in the development of the Indian chess legend’s game. As a child, Anand refined his chess skills at the Tal Club, which was run by the Soviet House of Culture in the city that was then known as Madras. The Indian Grandmaster has attributed a part of his success to this childhood training in the cultural centre as well as to his visits to Moscow since the mid-1980s for games and interactions with the Russian chess fraternity. The first time Anand fought for his chess crown was back in 1995, when he lost to Garry Kasparov in New York. He then defeated Vladimir Kramnik (2008), Veselin Topalov (2010), before defeating Gelfand in Moscow two years ago. 23-year old Carlsen became a grandmaster in 2004, at the age of 13 years and 148 days, the third youngest grandmaster in history. In 2010, at the age of 19 years, 32 days, he became the youngest chess player in history to be ranked the number one player in the world. His peak Elo rating of 2882 is the highest ever.